At each market I pick one canvas that I absolutely cannot live without. I put it in the shop and if it sells, so be it and if not, it belongs to me. This market, I was stopped in my tracks by Kelly Clark’s Ark canvas with animal pairs. I looked at. I ordered other things. I had lunch. I went back and bought them all. Kelly’s booth had the 3D mockup, the 18 mesh (or 13 mesh) ark canvas and a dozen 18 mesh animals, mostly from the African savanna (I think—I am nothing if not geographically and directionally challenged). 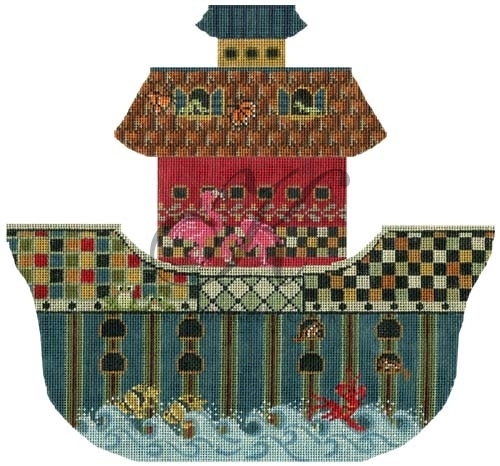 The ark is available on either 18 or 13 mesh canvas, the animals only on 18 (forever and ever). So here’s my plan…stitch the 18 mesh version, create a stitch guide and provide a 13 mesh guide on request. I am going to offer a 12 session class in our shop on Amelia Island. And then I am going to display the finished project in a prominent place in our home. I cannot wait to get started!